The body and door is constructed using high quality steel and fire resistant material to provide solid protection. The front edge of the door is secured by 3 moving bolts and a full rebate runs on the back edge of the door, each bolt measures 25mm diameter. Standard double locking system consists of one keylock and one 3 wheel combination lock with relocker. LG basic & Key option. The safe comes with 2 adjustable shelves inside, alternatively the user can remove the shelves to put in vertical files. 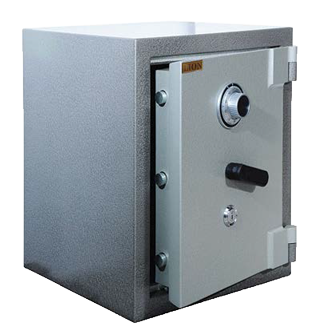 The safe is painted with durable and scratch resistant epoxy paint.